I love carrot ribbons, so pretty. I will have to give this dressing a go for sure! Thanks Alexander! 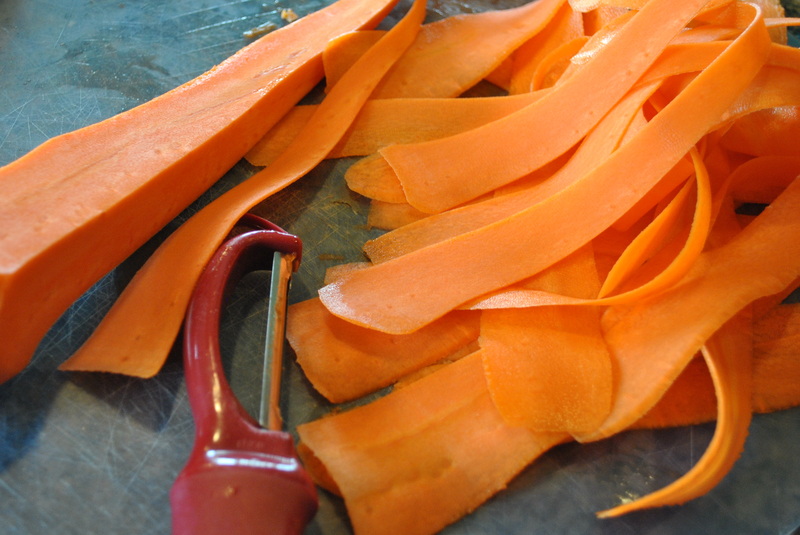 My sister taught me how to make carrot ribbons, Now carrots aren’t nearly as pretty any other way in a salad! 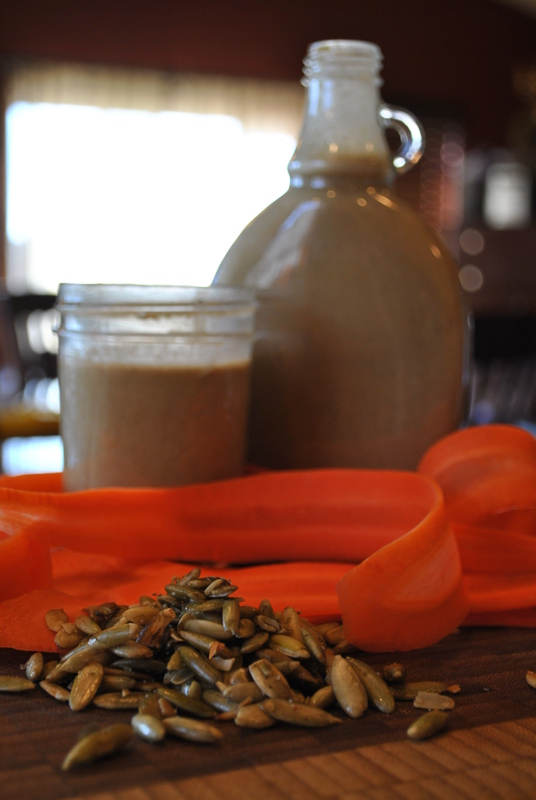 You’ll love the dressing, as I know you love pepitas! Okay, did your Mom hang out with mine because we had the shredded carrot, mayo raisin salad at least once a month when I was growing up! LOL, I HATED that salad. My Mom made that goopy mayo thing every month. Yeck! I think you’ll like this one a little better Sarah! Funny all our moms made it! She must’ve! That’s so funny! I am a very lucky girl… She brought chia seeds, sesame seeds, a gallon of fresh pressed olive oil, all from nearby their home in Mexico. Wonderful! Beautiful! and sounds so good! Seriously, your Mom sounds like the best! 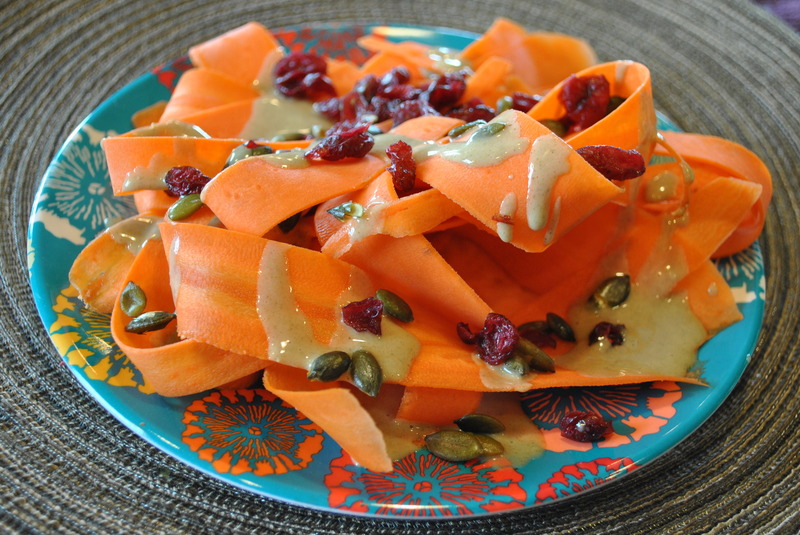 I love pepitas, I love all your amazing ideas, pepita butter sounds so so so so GOOD! She’s pretty wonderful! 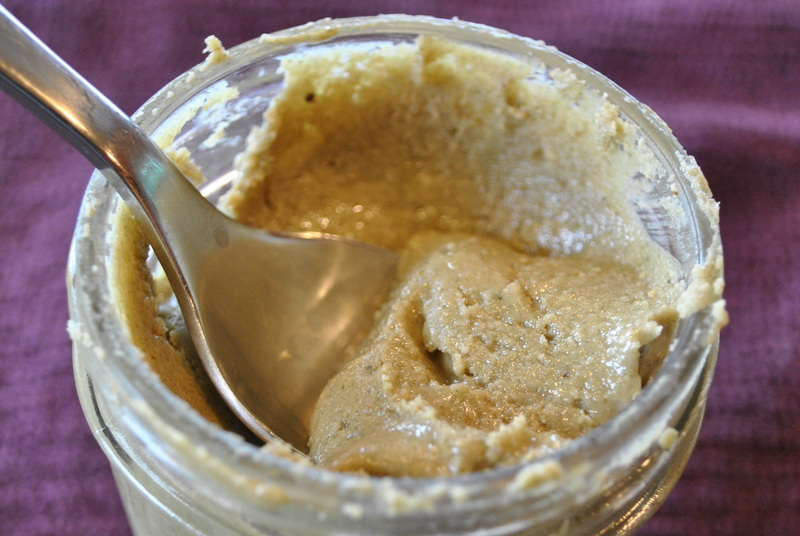 Oh my goodness, the pepita butter, I LOVE it, it’s more savory than other nut and seed butters, which is fabulous! Super Model Salad it is! Though I don’t think super models really eat, they just smoke and eat cotton balls…. Mama mia that’s a beautiful salad! Love the colors, love the cranberries and need to get my mitts on some dang pepitas ASAP!! It’s so pretty and sounds completely delicious!!! OooooMG that looks so good! Can’t wait to try it! I know, right?!? And I thought I could only make nut/seed butters in the food processor… Pshaw. I just needed to do more scraping down, LOTS more scraping down, but it’s still 8 minutes faster than in the cuisinart! What a gorgeous salad – I’m so impressed, Somer! Beautiful salad. I am so in love with the orange color of carrots! I love pepita dressings, too! This photo rivals Annie’s prize cupcake photo. Mmmmm! This salad looks amazing! Love the carrot ribbons! Looks beautiful! Will definitely give this a try. My mom makes a similar carrot/raisin salad, ha ha! I love your grown up version, carrots ribbons are very fancy! The dressing sounds wonderful, love how it seems anything can be made into “butter”. Yum. Carrot ribbons look so pretty! Are they hard to make?? Excited to try this dressing – I’m always in the market for a good dressing. Nice! This sounds so nutty and delicious! Lucky you that your mom brought so many of them for you. So lucky! She brought all this stuff up from Mexico a store near their beach home in Mexico, including a quart of chia seeds, she said they maybe cost her a couple dollars. The fresh pressed olive oil she brought was insane. I’ve never tasted anything like it, It made my premium olive oil taste like toxic sludge in comparison. Sigh. This looks amazing Somer! I almost made it last night but I am thinking tonight is THE night. I love pumpkin seeds and just found a big container hanging out in the cupboard. Typical bloggy recipe fate. XO! This is so lovely…I dunno if I want to eat it, or paint a canvas of it! Just drink it and you’ll be fine! If anyone has influenced my tastes in food lately it’s been you! I think often about your blog posts and the recipes when I cook and figure out menus. It’s just different, better than the other veggie-centric recipes in cookbooks, blogs and cooking shows. Pingback: WHAT??? Coming soon… | Good. Clean. Food. Wow the dressing sounds like I could put it on a WHOLE mess of things. Sounds great – thanks! 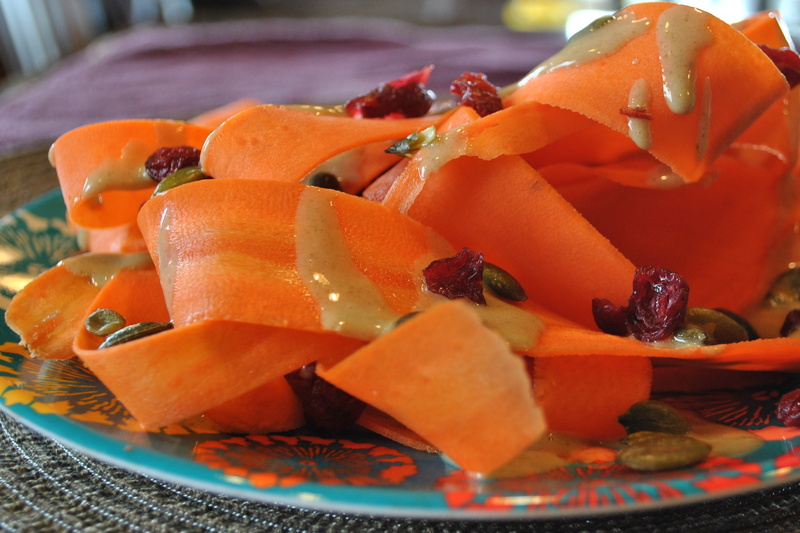 love those lacey carrot ribbons and the dressing sounds palatable…..cant wait to give it a try ASAP…..